Arriving in the wake of Tim Burton's incomprehensibly bad "re-imagining," "Rise of the Planet of the Apes" manages to succeed in achieving an impossible hat-trick of being not only a successful reboot of the legendary franchise, but acting as a simultaneous prequel and standalone film that the five people on Earth who haven't heard of the Heston original could approach and thoroughly enjoy. Directed by Rupert Wyatt, "Rise of the Planet of the Apes" quickly establishes itself as a movie worth going bananas over by taking an approach to filmmaking that allows no room for monkey business (because after all, monkeys aren't apes). Required, lame puns aside, the apes, well one specific ape in particular turns out to steal the show, and not surprisingly this digital ape, Caesar is the creation of Weta Digital and brought to life through motion capture by the new King Kong himself, Andy Serkis (who rightfully should have won an Oscar for his motion capture work as Gollum). Along for the ride is a colorful cast of character actors, headed up by a dialed back James Franco. Being a prequel film that attempts to explain how apes would eventually rise up to control Earth, humans are a necessary evil and while the characterization of every human co-star save for John Lithgow as Charles, Dr. Will Rodman's (Franco) Alzheimer's afflicted father, Caesar's flesh and blood exist to either be sympathetic to Caesar or find ways to oppress him. 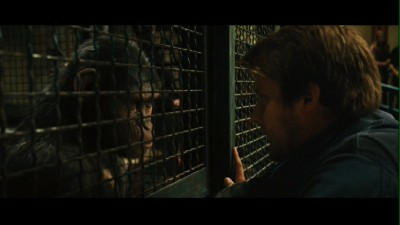 The turning point in the film is when Wyatt puts his faith in the hands of Weta and Serkis, shifting the tone of the movie from a straightforward science minded (obviously the science is absurd, but the movie takes enough a serious tone to "sell" it to crowds) tale to one of the best twists on a prison film, since "Cube." Taken from the people who love him, the now intellectually advanced Caesar is thrown to the wilds of a prison for wayward apes disguised as a sanctuary. As with all prisons, there's a warden (Brian Cox) who does his job and nothing more, and a sadistic guard, the warden's son (Tom Felton, cementing his status as the millennium's new William Zabka). 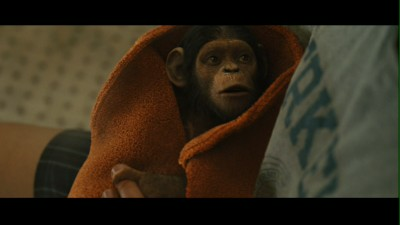 "Rise of the Planet of the Apes" has it's share of plot holes and if it weren't for the moving performance from Serkis and third-act siege on the city by Caesar and his new army of super apes, the film would have been a middling disappointment, although still much better than Burton's "quirky" turd. Serkis brings to the role exactly what you expect from him by now and you'll quickly forget Caesar is a digital creation because his expressions are the most human of anyone in the film. At his best, Serkis gets the ape lover in me to get a bit misty eyed as he copes with a sense of betrayal from those he loved and isolation from "his own kind" that stirs a sense of character altering rebellion, leaving Caesar as one of the year's biggest heroes. 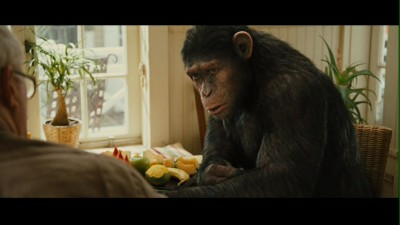 For the dedicated Apes fan, Wyatt sprinkles numerous nods and homage's to the previous films throughout and does, obviously, leave the door open for a sequel that is likely to feel more like the '68 original, by addressing what seem like obvious plot holes with clever twists to make a simian easily believable within the boundaries of the film universe. Wyatt's cleverness also makes sure the film never "devolves" back to its melodramatic origins, pushing forward Caesar's prison saga to the anticipated battle of the streets of San Francisco that is not only exciting but also incredibly tense in the closing moments. "Rise of the Planet of the Apes" doesn't come close to matching or topping the original, but it stands tall with the best of the sequels and washes away the foul taste of the last attempt at a reboot, by respecting the series' origins while steering the series in a somewhat familiar but alien enough direction, making the next installment eagerly anticipated. In the meantime, hopefully those who make the real decisions, are able to look past the silly surface appearance of this surprise hit and finally reward Andy Serkis with some much needed recognition for his amazing work. The 2.35:1 anamorphic widescreen transfer lacks the sharp pop one normally associates with a big budget summer blockbuster, but is visually pleasing all the same. A mild amount of grain/digital noise persists throughout the natural looking film that is graced with finely balanced contrast. The Dolby Digital English 5.1 audio doesn't really get a chance to flex its more immersive muscles towards the end of the film, but does so remarkably, especially during the tense standoff between the apes and ragtag band of law enforcement sent to quell the uprising. Dialogue is properly balanced against score and effects. English 5.1 descriptive audio as well as Spanish and French Dolby Surround tracks are also included. English SDH and Spanish subtitles are included. The DVD contains two brief featurettes titled "Mythology of the Planet of the Apes" and "The Genius of Andy Serkis" which is a more focused piece than the former. Rounding out things are two wisely deleted scenes, one of which would have damaged a specific character in the film (the effects are almost all unfinished, so chances are one was scrapped early one), while the other would have been a nice post-credits stinger. The film's original trailers are also included. "Rise of the Planet of the Apes" isn't the smartest sci-fi film out there, but the strengths of the second and third act, with Andy Serkis wisely in the forefront as Caesar makes it worth the time and money investment for all interested parties. The film truly is a fine prison film beneath all the prequel/origins elements that originally got the film a green light and those who invest in Caesar's plight will be rewarded viscerally and emotionally. Highly Recommended.